Numbers of African Grey parrots is in decline according to the National Geographic due to lost of natural habitat and high demands by the pet trade. 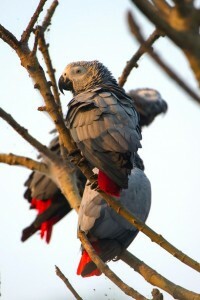 Even though the United States and European Union have forbidden African Grey imports, captive-bred trading remains present. National Geographic explains that according to the Convention of the International Trade in Endangered Species of Wild Fauna and Flora (CITES) the population of African Grey parrots continues to decline. Once a common site in the deep forests of West and Central Africa it is almost impossible to spot African Greys in the wild today. The Avian Journal Ibis recently published a study revealing that these birds have almost disappeared from Ghana, a country where they once flourished. According to CITES, African Grey parrots still remain the single most imported bird for the pet trade and since 1980 there have been 800,000 legally imported parrots. This number does not account for the total number of parrots taken from the forest. Because of this fact CITES has delivered a proposal to finally stop trading of wild-caught parrots. African Grey parrots are particularly susceptible to death in captivity and it is estimated that 45% – 65% died prior to reaching the export markets. Further more by destroying their natural habitat and especially by removing large trees where the species nests and breeds humans are slowing the recovery process of the African Grey parrot. Next PostNext Post Why do Parrots Bite and What can you do?